Dru Drury (1725–1804) was a silversmith with a passion for entomology. His profitable business enabled him to spend significant amounts of money on his hobby and over a thirty year period he built up a famous collection of over 11,000 insect specimens. As well as collecting English insects, he acquired more "exotic" samples by persuading the officers of ships sailing to other continents and other travellers to collect insects on his behalf; for this they were paid 6d per insect 'whatever the size'. 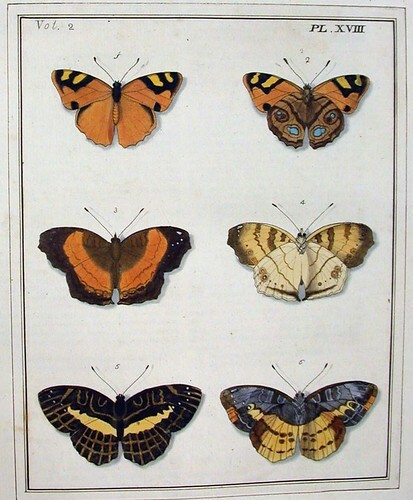 Illustrations of natural history was published in three parts between 1770 and 1782. The illustrations were based on specimens in his collection. The hand-coloured copperplate engravings were beautifully executed by Moses Harris; he was responsible for illustrating several books of natural history by various authors, as well as his own works. Drury assures the reader in the preface that 'the utmost care and nicety has been observed, both in the outlines, and engraving. Nothing is strained, or carried beyond the bounds nature has set'.